Founded in 1985, the Little Star Chorus is a leading children’s choir in China that enjoys a high reputation home and abroad. As a subsidiary of Shanghai Media Groups, the Little Star Chorus has participated in many big events including the APEC Summit, 2005 Aichi Expo and 2010 Shanghai Expo. The chorus also received numerous awards such as the Golden Award in the 1st China Junior Singing Contest in 2006, the Golden Award in the Hong Kong International Youth & Children’s Choir Festival, the Grand Award in the 4th China Children’s Chorus Festival, the First Prize in “Charming Campus” National Campus Art Performance for two consecutive years in 2009 and 2010, the First Prize in 2011 Vienna Youth Choir Festival, the Golden Award in 2012 Invitational Sino-German Youth Chorus Tournament, and the Gold Diplomas in both Young Children’s Choirs and Folklore categories of the open competition in the 8th World Choir Games Riga 2014. In addition, the album “Tunes of Vendors” won the Golden Disc Award in 2010. They won two gold awards at the Ninth World Choir competition in 2016. 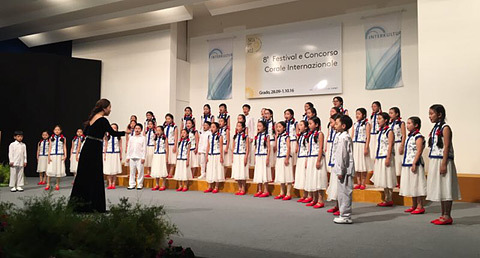 In the same year won the gold award in Italy Sun Island International Choral Festival . Having recorded more than 70 albums, the Little Star Chorus has released dozens of albums such as “Song and Smile”, “Walking in October’s Sun”, “Heart to Heart”, “Tunes of Vendors”, “the One World” and “Ji Gong” , all of which gained great popularity among the young generations. In recent years, the choir released eight more albums, namely “the Oriental Oasis”, “the Flower Girl”, “Tunes of Vendors”, “World Expo”, “Hello Shanghai”, “Poem of Love”, “Songs of Peace”, and “Flowers underneath”, the album dedicated to the 2008 Sichuan Earthquake. The chorus worked with many world-level vocal masters. One of them, the famous Spanish singer Plácido Domingo, speaks highly of the Little Star Chorus Group, acclaiming it as “the Voice from the Heaven”. Jin Liang, permanent conductor of the Shanghai Little Star Chorus. He graduated from the Conservatory of music, Shanghai Normal University, and studied with Professor Yang Qiaoyun. He has won many international and domestic Piano Competition awards. He also had gold award of World Choir Competition for twice with the little star chorus. In the little star chorus, he is concentrate on learning chorus command, rely on virtue of their vocal music, harmony, piano and other solid basic skills, in the pursuit of his career. 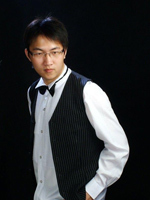 Zhang Lu, young conductor, member of Shanghai Musicians Association, member of American Choral association. She graduated with honors from the Department of music, Shanghai Normal University, major in vocal music July 2008, studied under the famous soprano Xu Xiaoyi. Since August 2008, she has served as the permanent conductor and vocal director of Shanghai TV station. She is focusing on her busy work but she still learning the main chorus children ‘s chorus direction. 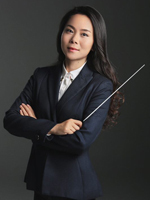 She had been studied with Professor Yang and Ms. Wang Yan who is famous conductor. She has won many international and domestic Piano Competition awards. For the first time with a group of Shanghai concert hall, the industry unanimously praised on July 2013. In 2014, went to South Korea to attend the closing ceremony of the Daegu Film Festival. On July 2015 went to Europe to participate in the Bratislava youth choir competition won first in children group.